A mysterious girl who has appeared before Shintarou in a shopping center. She's seemingly the leader of the Mekakushi-dan. First appeared in Blindfold Code. A girl that plays the role of the leader of the Mekakushi-dan. 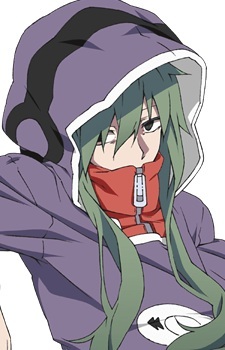 She's essentially good-natured, but struggles to keep the individual members, like Kano and Seto, in line. Using her "eye concealing" ability, she can erase the perception towards objects within a certain distance of herself or her surroundings. She is most always seen listening to music through her earphones. She was the second daughter of a wealthy household, but she was her father's illegitimate child with a lover and was fairly distant from the rest of the family. As a young girl, she received regular verbal and emotional abuse and came to wish that she could disappear. One day, her father's company went bankrupt due to economic changes. Her father set the house on fire, and the whole family was caught up in the fire. As a result, they all burned to death. She entered the Heat Haze with her sister and was possessed by the Concealing Eyes snake. Her sister's body was never found.